Independent room in beautiful village house. Property 5: Independent room in beautiful village house. Cosy Appart-Villa 60m2 at Doors of Avignon 2/3ps a haven of Peace near shops! Property 25: Cosy Appart-Villa 60m2 at Doors of Avignon 2/3ps a haven of Peace near shops! 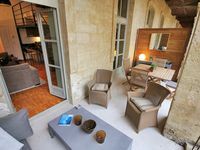 Property 37: APARTMENT FOR FESTIVAL NEAR AVIGNON, A CORNER OF PARADISE! Cottage Bédarrides, Bédarrides - Un Gîte en Provence gîte "Camille"
Property 38: Cottage Bédarrides, Bédarrides - Un Gîte en Provence gîte "Camille"
This apartment is spacious, very well equipped and beautifully decorated. Two bonuses are its outdoor patio and proximity to the sunny plaza at Palais Des Papes. It has everything you need for your visit to Avignon.